Hurling for a great cause! 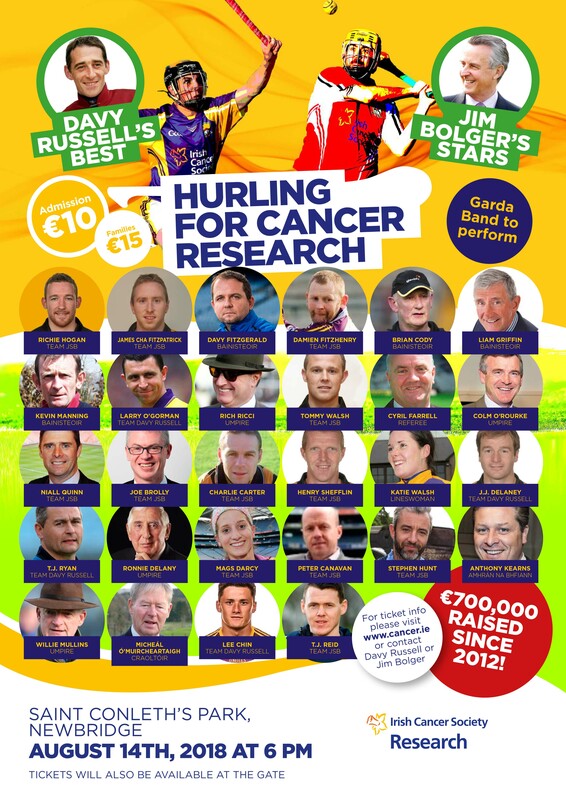 Hurling for Cancer is back for another year, with stellar line-ups going head-to-head all in the name of Irish Cancer Research. 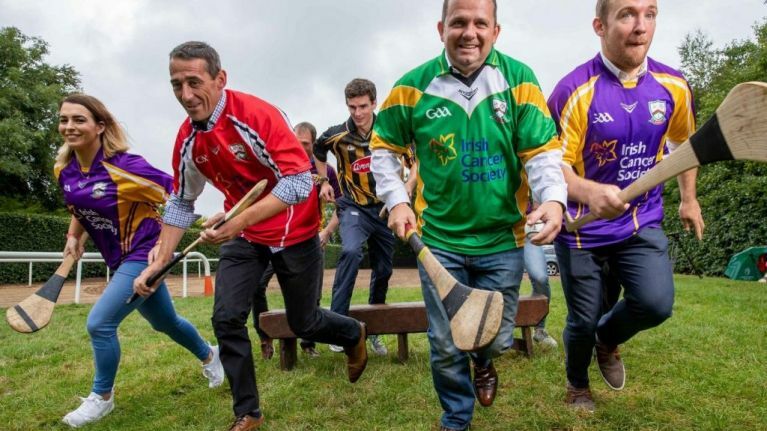 The event, which has been organised for the seventh year in a row by horse-racing legend Jim Bolger and Irish champion jockey Davy Russell, will see a host of Irish hurling and horse racing stars come together for what promises to be another pulsating clash next Tuesday, August 14, in St. Conleth's Park. Davy's team were victorious in last year's game so Jim will be looking for some revenge in this year's contest to get his team past the winning post once again. Jim Bolger’s stars have come out on top three times, while Davy Russell’s Best tasted victory last year, with the other two years ending in draws. 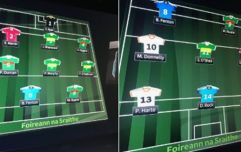 This year's teams are made up of a mix of GAA and horse-racing stars. They include Wexford All-Ireland winning manager Liam Griffin, Kilkenny manager Brian Cody, jockey Kevin Manning, and horse-racing legend Rich Ricci. James Dowling an amateur jockey at Bolger's yard, is one of only a few men to win an All Ireland medal and win a horse race. No mean feat! The former Kilkenny U21 star will captain the J.S.B team. Other familiar faces that will be in attendance at the event will include former Olympic runner Ronnie Delaney, while rugby player Tadhg Furlong, commentator Tony Ward, horse trainer Willie Mullins and horse owner Rich Ricci will all act as umpires for the day. Miriam O’Callaghan and Katie Walsh will act as lineswomen for the game, while Micheal O Muircheartaigh and Sean Ban Breatnach will provide the commentary. Event organisers Una Manning and James Dowling have both been working tirelessly over the last few years promoting the event. Hurling for Cancer has been an amazing success since it first began in 2012 and to date, has raised over €700,000 for the Irish Cancer Society’s Cancer Research programme. "My father Jim Bolger was very friendly with the late Professor Fitzpatrick, the former head of Research in the Irish Cancer Society". "Professor Fitzpatrick asked Jim to come up with an idea to raise money for some cancer research which he was heading up. Jim then spoke to Davy Russell and together they came up with the idea of pitting jockeys and hurlers against each other for an almighty clash of the ash". "The money helps fund the Irish Cancer Society's research projects thus improving the lives of those with cancer - developing better treatments and techniques to diagnose and treat the disease". Pre-match entertainment begins at 5:30 pm, with the match throwing in at 6 pm. Tickets cost €10 for adults and €15 for families. You can buy them here or call 1850 60 60 60. Tickets will also be on sale at the gate on the night.